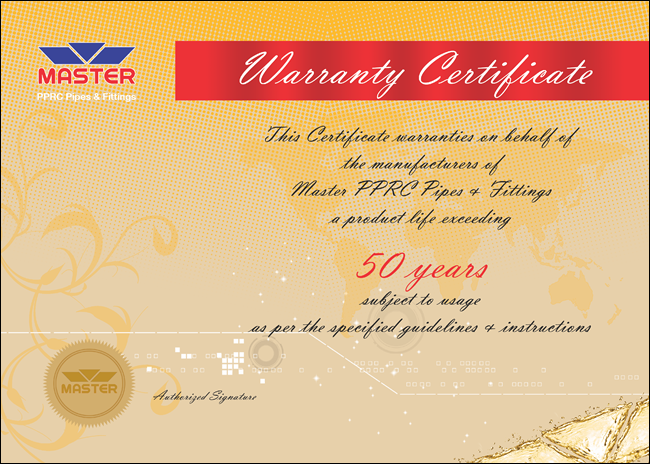 Subject to the conditions and limitations set forth below, Master Polyplastic Industries Limited warrants to the owner of Master PPRC Products that such products are free from actual manufacturing defects and will remain serviceable under normal conditions of intended use for fifty (50) years from the date of completion of their proper application. Defects or failure of, or damaged caused by, materials used as base or filling in which the Master PPRC products are applied. Damage to the pipes or fittings by settlement, distortion, failure or cracking of the walls or foundation of the building. Damage caused by the severe weather, including but not limited to lightning, tornado, hail, flood, earthquake, or winds in excess of 80 miles per hour. Damage caused by not testing the pressures in lines with the help of a pressure testing pump as a part of the installation process. Damage caused by fire, explosion, chemicals, radiation, or any other cause except ordinary wear and tear of the elements. Defects, damage to, or failure of flashing, metal work or other material furnished by others. Defects or failure caused by misapplication of the Master PPRC pipes & fittings or application which is not in strict adherence with Master's application instructions and approved practices. Equipment, installation, structural changes or other alterations to the walls or floors after application of the Master PPRC Products. Damage to the wall/floor due to any causes other than inherent manufacturing defects in the Master PPRC Products. THIS LIMITED WARRANTY IS EXPRESSLY IN LIEU OF ANY AND ALL OTHER WARRANTIES, EXPRESSED OR IMPLIED, INCLUDING ANY WARRANTY OF MERCHANTABLITY OR FITNESS FOR A PARTICULAR PURPOSE. THIS WARRANTY IS SPECIFICALLY CONDITIONED UPON BUYER'S OBSERVANCE OF A COMPLIANCE WITH ALL TERMS AND CONDITIONS SET FORTH ABOVE. IN NO EVENT SHALL MASTER BE LIABLE FOR ANY CONSEQUENTIAL OR INCIDENTAL DAMAGES OF ANY KIND, INCLUDING BODILY INJURIES TO ANY PERSON, ANY DAMAGE TO ANY BUILDING OR ITS CONTENTS OR ANY LOSS OF PROFITS. This warranty is enforceable only by the original owner and is not transfarable to any subsequent owner of the structure on which the product is placed or to any other person. THIS LIMITED WARRANTY WILL NOT BECOME VALID UNLESS THE OWNER COMPLETES THE REGISTRATION FORM AND MAILS IT TO MASTER POLYPLASTIC INDUSTRIES LIMITED WITHIN 30 DAYS OF COMPLETION OF INSTALLATION. FAILURE TO COMPLY WITH THIS CONDITION SHALL RENDER THE WARRANTY OF NO FORCE OR EFFECT. IN THAT CASE, THE PRODUCT SHALL BE SOLD AS IS AND WITHOUT ANY WARRANTY WHATSOEVER.